Athletes By Design (ABD) hosted race five of The Chicago Cyclocross Cup (CCC) at Sunrise Park in Bartlett, IL. Traditionally ABD Sunrise Park is hailed as the power course of the series. 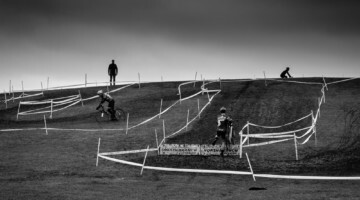 Racers and spectators recognized the original Heckle Hill, wooded sections defined by trees, log jumps on a false flat and straight aways that offered no rest. New to the course was a longer and wider starting strait that fed racers into the main track, minimizing early bottleneck effects on this fast course. Todd Busteed joined Kenny Labbé on the mic for constant race coverage by the region’s top announcers. 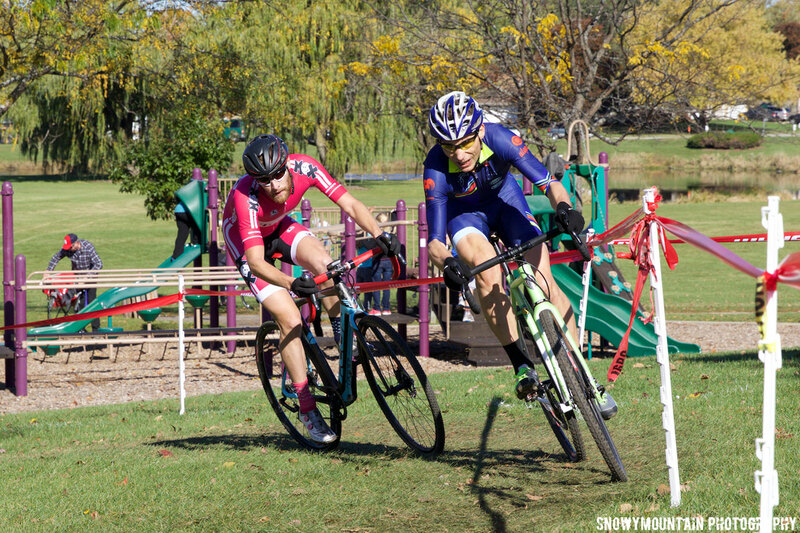 Early in the Elite Women’s race, Sydney Guagliardo (PSIMET Racing) and Danielle Arman (Smith) (Tenspeed Hero) made a verbal pact to work together and break away from the group. They wanted to put as much distance as possible on the field until two laps to go, where all bets were off. “Let’s make this race exciting,” they agreed. And so they did. Taking turns on the front, they amassed a sizable gap that made this race their own. “We were really able to learn a lot from each other, and about each other’s strengths and weaknesses. 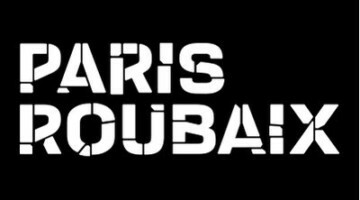 It’s actually kind of dangerous,” Arman explained after the race. Arman and Guagliardo were still together in the last, long uphill climb leading towards the finish. They crawled to the final S-curve before the finishing straight, each waiting to see what their opponent would do. Guagliardo led, and at the curve Arman jumped to the outside for the sprint. The final 200 meters was an all out battle. As they passed the line in a photo finish, Guagliardo’s front wheel went parallel to the ground and she somersaulted over her bike, landing with a thud in front of the officials. Both women had thrown their bikes forward at the line, and when Guagliardo’s unweighted front tire hit a divot it threw her wheel. Arman came away with the win by half a wheel. Guagliardo came away with a broken collarbone, a second place finish, and solace in having been a part of the most exciting race of the day. Guagliardo kept a positive attitude, smiling and congratulating Arman. She admitted that the pain of injury was tolerable, but she was incredibly disappointed in having to now miss much of the season after working hard and spending time away from family for training all summer. 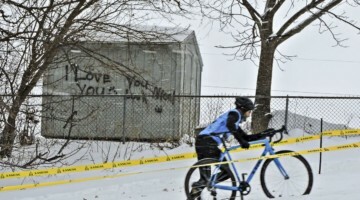 She still has hopes to compete at Nationals in January. Behind this dramatic scene for the win was another intense bout for the last step of the podium. 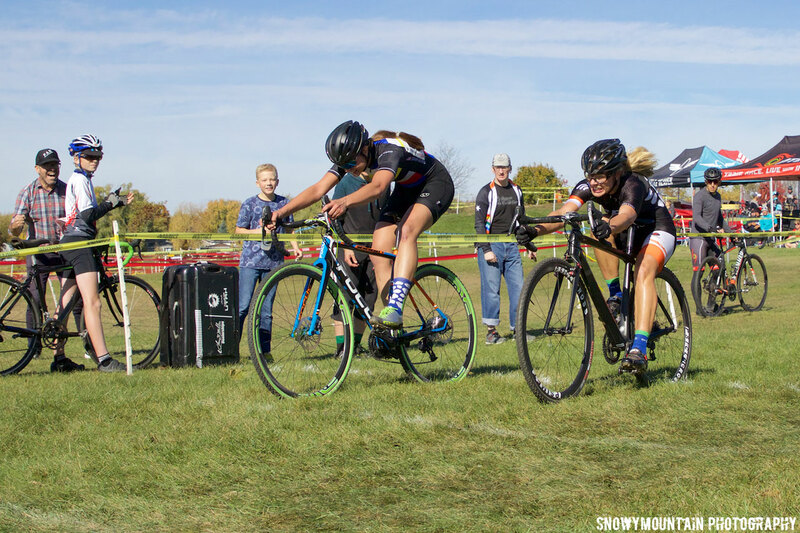 Alijah Beatty (NorthStar Development Cycling) from Washington, IA, Amanda Schaap (Speed Merchants) from Jenison, MI and Chicago’s Maria Larkin (Chicago Cuttin Crew) chased the leaders to a photo finish of their own. Larkin eked out the third place spot and maintained the series lead. 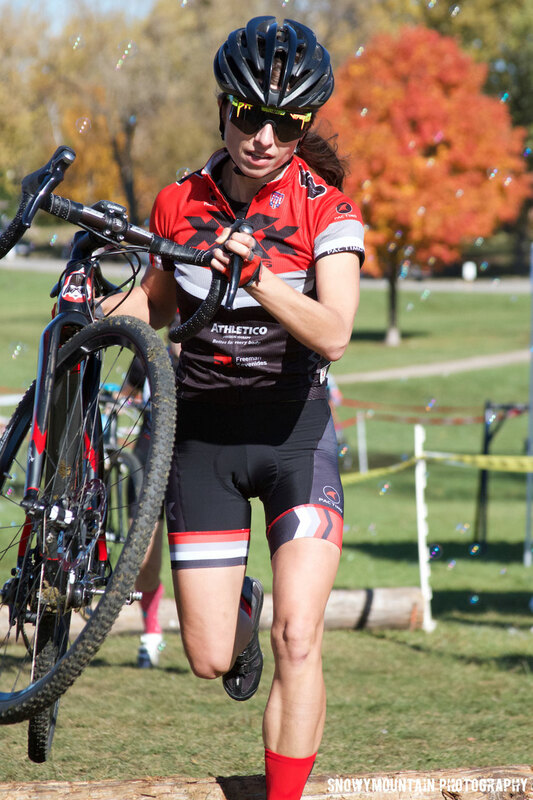 Beatty finished fourth, with Schaap a quarter wheel behind her. The Elite Men’s race once again had a cluster off the front early in the race. The usual suspects – series leader, David Reyes (Heritage Race Club), last week’s winner Michael Dutczak (EGO p/b Sammy’s Bikes), David Lombardo (True Veterinary Care Cycling p/b Gryphon Advisors) and Brandon Feehery – were joined by 16 year old Caleb Swartz (Trek Cyclocross Collective) from Madison, WI. 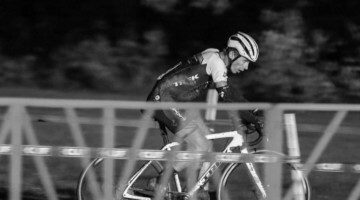 A couple weeks prior, Swartz won Trek Cyclocross Collective’s Men’s Cat 2 race both Saturday and Sunday. 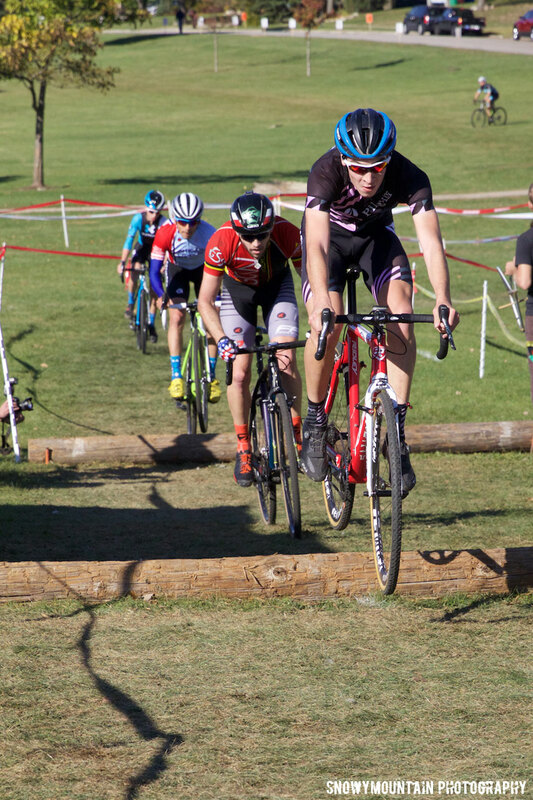 With a second row start here at Sunrise Park, he got caught behind an early crash but managed to work his way up to the lead group. Once there he rode conservatively, letting others take the lead while he stuck with the group. Just before the bell lap, Dutczak laid out a convincing attack that broke the group apart. Reyes answered, bringing the group back. Dutczak’s gutsy move worked against him as he was not able to stay with the train when Reyes lead the leaders past him. At a tight turn at the top of the log jumps, Reyes got caught in a stake and thrown off his bike. Feehery and Swartz went down behind him. Lombardo was able to maneuver around them. Dutczak saw this opportunity and tried to catch up. 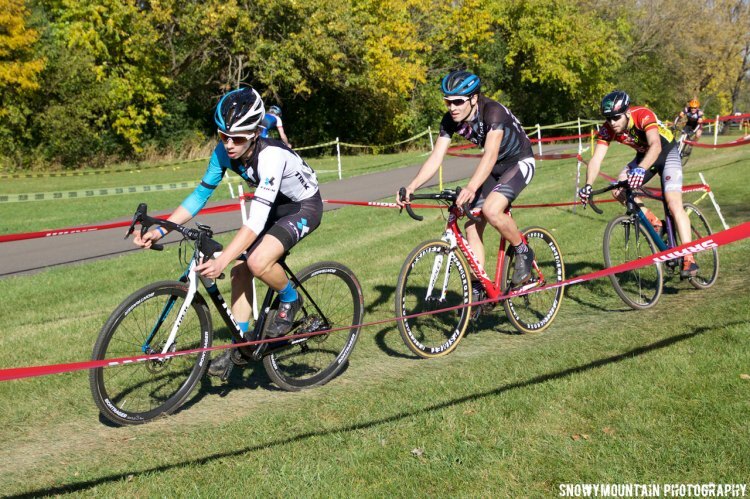 The leaders recovered quickly, and with a quarter lap left they hustled through the final corners to the finish line. Caleb Swartz made it across the line first for his first win in a Category 1/2 race. Brandon Feehery finished second. David Lombardo rounded out this young podium. David Reyes who bore the brunt of the late crash finished fourth, but held on to the series lead. 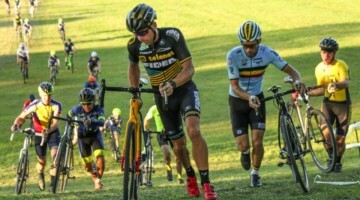 Michael Dutczak, who was never able to fully recover from his massive attack, finished fifth. 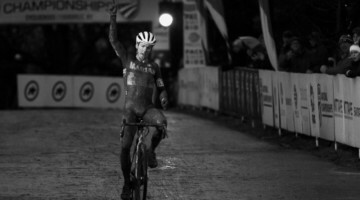 Winning a CCC race was a season goal for Swartz, and he was able to achieve it his first time out. He plans to come back for a few more races. Though next weekend, both Swartz and Arman are headed to the Pan-American Cyclocross Championships in Kentucky. 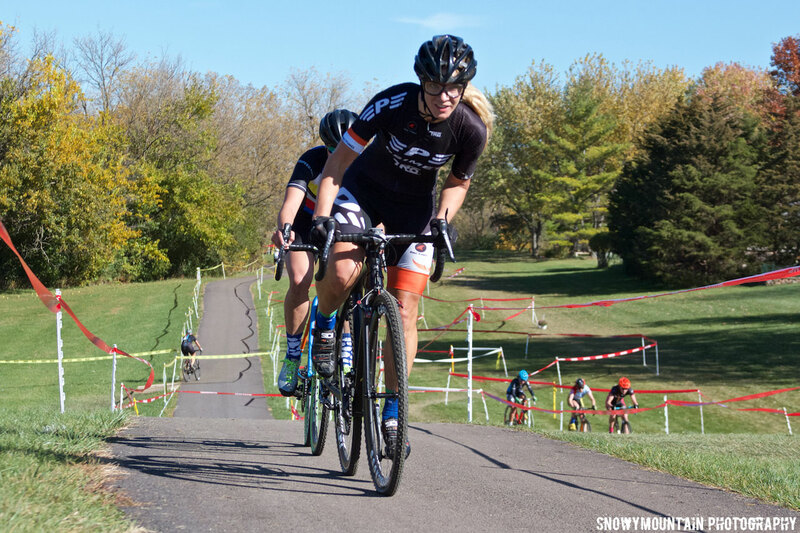 The series continues at Campton CX, where Bicycle Heaven hosts the Halloween race on Sunday, November 1st. Expect costumes, kid’s races on a separate course and food vendors. Find out more at chicrosscup.com.